Home distressed jeans to a red carpet event? 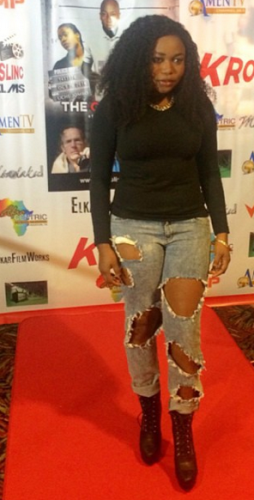 Ladies Would you wear this ripped Ladies, Would you wear this ripped, distressed jeans to a red carpet event? Ladies, Would you wear this ripped, distressed jeans to a red carpet event? Actress Ruth Kadiri did. She wore this ripped jeans, black top and boots to the premiere of The Other Side in Houston last night. Cool or not cool? Would you try it?